Check out the video review right here or read on below! For links to the product click here to scroll to the bottom! 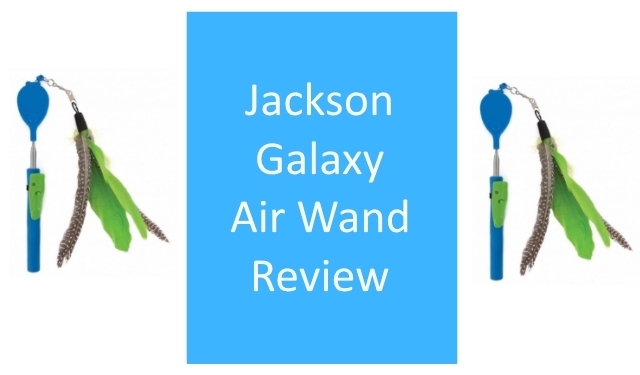 The Air Wand is a toy made by Petmate and endorsed by Jackson Galaxy. 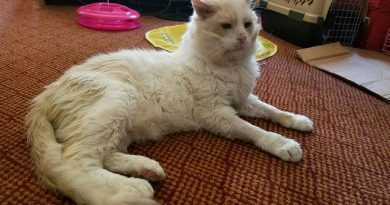 When my wife and I first got our cat Beast we had heard a lot about Jackson Galaxy online and across TV based on his show My Cat From Hell. Given this we figured the guy would only endorse a high quality product and while we were walking through PetCo we decided to pick one of these up. Extendable Wand: The wand itself is made up of six total segments that slide into each other to collapse when you’re not using the toy. This means instead of a traditional single piece wand toy that this wand folds down to about 8.5 inches. When it is fully extended it is about 32 inches in total length. Retractable String: Several other wand toys I’ve purchased continually have the string exposed. While they tend to be made of much heavier duty string I am still not a fan of leaving them exposed due to the potential choking hazard. This string extends about 22 inches and is very easy to retract or pull out with the simple push of a button. 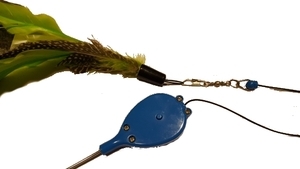 Interchangeable Feathers: If you’ve ever been out fishing and been able to easily witch lures out without having to tie off a completely new knot then you’ll be familiar with the mechanism that enables you to easily switch out features. There’s a small snap lock on the end of the string that means you can pop feather ends on and off in seconds if yours becomes damaged or if you’d like to try a different one out. We’ve had this toy a solid year and and it has stayed in great shape and been through a bunch of different play sessions with both my resident cats Lexi and Beast and also through plenty with our foster cats as well. One thing I will call out is that neither of my resident cats are big chewers. The string on this toy does look pretty light weight, but I’ve personally never had any trouble with them attempting to chew it. As with any toy, once in a while my cats will ignore if they are not in the mood to play, but I’ve had great luck with this wand. There’s a bit of finesse involved in finding just the right speed to rotate the wand with the included feathers, but once you do they spin and make a sound just like rustling bird leaves. When I get the toy moving like this neither of my cats can resist and they’ll both come right out to play. All in all I have had an excellent experience with this wand and would highly recommend it to anyone that doesn’t have cats that like to play really rough. The reason I’ve given it 4 stars instead of 5 is because of the number of other folks I’ve seen complain about its ability to stand up to cats that are more aggressive and rough in play. I’m lucky I haven’t had this issue, but you should definitely note that this toy does not look to be manufactured to handle really rough play sessions or chewing on the string. Extendable Wand: The wand shrinks to a length of 8.5 inches and when fully extended it is about 32 inches in total length. 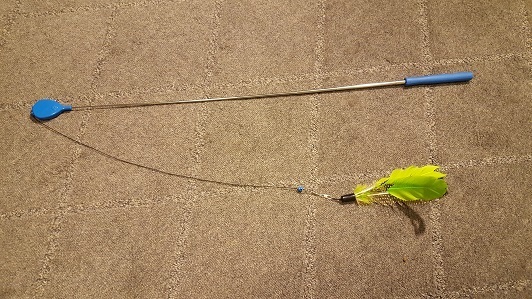 Retractable String: The string fully retracts into the head of the wand and when extended it is about 22 inches in length. Interchangeable Feathers: Switching the feathers out is super easy with a snap and swivel piece on the end of the line. Price for Value: This toy is dirt cheap and gets the job done well for my cats and I. I use it every single night before bed to help tire Lexi and Beast out and they are both engage with it and have never damaged it. Durability of the Feathers: The feathers are actually real from what I can tell. I’ve never seen bright green feathers on any animal before, but I can’t imagine that it is too hard to dye them. That being said, my cats love it. The feathers have also stood up to numerous play sessions over and over. 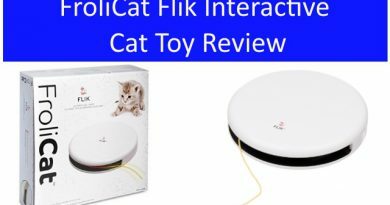 The string is quite light weight and numerous users have complained that their cat chewed through it in only a few play sessions. If you have a cat that loves to chew this is not the toy for you. The wand is made of relatively lightweight metal to keep it easy to handle, but that also means if you have a rather aggressive cat there is the risk of the retractable pieces bending and no longer working properly. Are the feathers real or plastic? There’s been a large amount of debate on whether or not the feathers are real or not. I’m going to assume they are real even though I have bright green feathers. In my experience the feathers are rather durable, but the break apart and fray like real feathers do too. How do you change out the feathers on the end of the wand? It uses a snap and swivel system similar to those used it fishing. You pop open a clamp and the feather attachments can be switched in and out in seconds. It is very simple and straight forward. How durable is it given its extendable wand and retractable string? 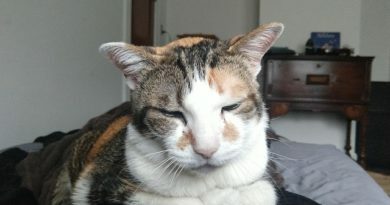 I’ve personally had zero issues with the wand or the string, but I’ll freely admit that my cats don’t play as rough as many I’ve encountered at the shelter. You would definitely not want to let your cat chew on the string given the thickness of it, it wouldn’t hold up to an extended chewing session. If your cat is pulling on the feathers you should not yank back or you’d be liable to break the wand itself. While there are mixed reviews of this wand on Amazon, my personal experience with it has been wonderful. I’ve had it well over a year and only lost 1 of the 4 pieces that were attached to the original feather end. With the three that are still there it is working well and my cats both still love it to death and bat it all over the place every night before bed time. I highly recommend this wand toy to anyone looking to pick up a good quality wand for their cat or cats. Do you use any wand toys that you have particularly liked? Have you tried out this one and actually found it to be a better experience than the one I’ve had with it? Perhaps you’ve used DaBird and have a comparison? 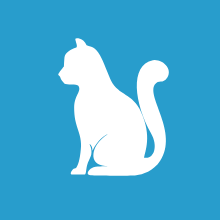 Please tell us about your experiences so everyone can find the best cat toys! Please leave a comment below or email me directly at Craig@StuffCatsWant.com if you have any thoughts to add to this article. Will the feather drop off easily if the cat chews on it? I’ve never had any issues with the feathers falling off, but they will get damaged if you let your cat directly chew on them for an extended period of time. I would suggest that you don’t let your cat chew on it after they’ve captured it. Time to pull it away again and start spinning! Thank you for sharing your personal experience with the wand because it is hard to figure out from so many reviews on amazon that are mixed. If this toy lasted a year and had only one feather come off, i think it is great quality. That was my take as well! Glad you found the review helpful.